Working nights doesn't mean you have to lose touch with your family and friends. With a little planning, you can still spend time and feel close to the people you care about. Sleep while your friends are at work or school, so you can spend any free time you have later with them. Set aside time to talk with your partner every day. Even a few minutes spent together over coffee will help you stay in touch. Plan at least one activity with family and friends each week. If you're a parent, arrange your schedule so you can attend a few special events with your children each year, such as holiday dinners, school activities, and more. Let your child help pick the events you should attend. Video record the special events you'll have to miss, such as birthdays, school sports events, dance recitals, etc. Watch them together. Set up a family bulletin board where you and your family members can display school work, notes, drawings, photographs, and cartoons. Make sure your partner can reach you by telephone or cell phone at work. If you can't receive calls, arrange a time for them to call you at home. Post a calendar in a highly visible spot and mark your shift schedule as soon as it's assigned. Bring up problems early and resolve them before they threaten relationships. When you feel irritable, make sure your family and friends understand that it's because you're tired, not because you're angry at them. This is especially important if you have young children. Get involved with activities that don't require a set schedule like sports or yoga do. Work out at a gym. Attend workshops or hobby clubs that interest you. These are places where you can meet people with the same interests as you. Develop a circle of friends who understand your work schedule and are willing to be flexible in order to spend time with you. Organize coworkers or friends who share your schedule and plan activities with them. Working evening hours can put stress on your family life and relationships, knowing how to cope with the challenges is the key. 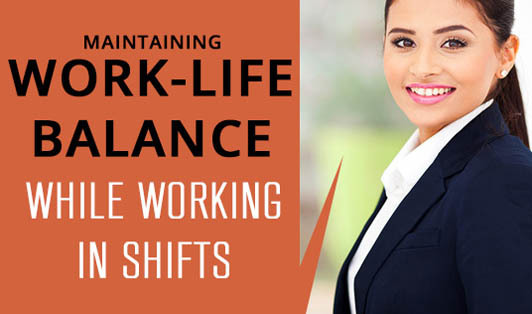 Gradually, through communicating, dealing with problems at an earlier time, prioritizing, socializing and making time for recreation, shift work will begin to have a smaller impact on your life.